In an effort to create more open and accessible atmosphere between the Internet Explorer team and the Web development community, Microsoft today announced the launch of The Developer Channel for Internet Explorer. Internet Explorer Developer Channel is a fully-functioning browser designed to provide Web programmers and early adopters an advance and better understanding of the features the team is currently working on and let them offer feedback before it reaches the broader public. "Today we're excited to announce the release of the Internet Explorer Developer Channel, a fully functioning browser designed to give Web developers and early adopters a sneak peek at the Web platform features we're working on," Microsoft said in a blog post. Thankfully, Internet Explorer Developer Channel runs independently of the user’s copy of IE and allows Web programmers to test newest Web technology and browser features without disrupting their current browser setups. You can download it right now at devchannel.modern.ie. 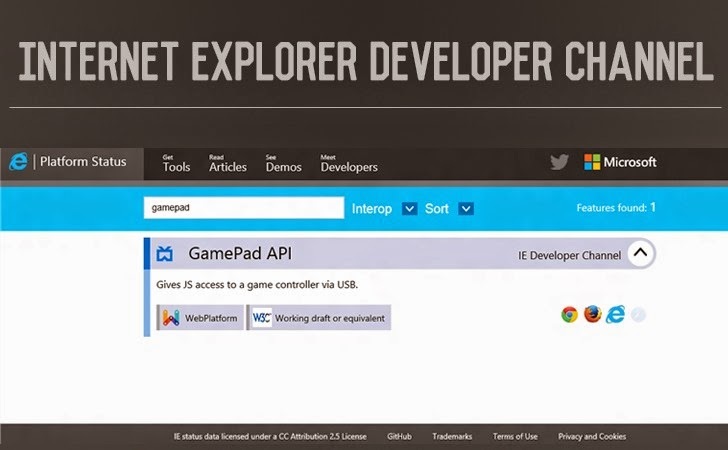 "Internet Explorer Developer Channel provides a sneak peek at Internet Explorer as it's being developed. It can run alongside and independently of IE11, and has all of the browser features that you love in IE11, as well as the latest platform features we're working on." The Internet Explorer Developer Channel is available only to Windows 7 SP1 users running IE 11 and Windows 8.1 users. In order to keep the IE developer channel separate from the existing IE11, the web browser will make use of Microsoft’s Application Visualization technology to visualizer the install. A new tool for an enhanced debugging with event breakpoints that help you get to your event-driven bugs faster. Better memory and user-interface responsiveness analytics, which support further reduction of noise through multi-dimensional timeline filter, while further increasing the semantic value of the data being reported by lighting up performance.measure() based instrumentation and dominator folding. An improved navigation tools that provides more keyboard shortcuts CTRL + [ and CTRL + ] will let you go back and forward with the tools. Also new header notifications allows you to quickly determine whether any of the profiling tools are running or how many errors your page has. IE now also supports access to the Xbox controller for web-based gaming, and the team has improved WebGL performance and added support for a number of WebGL features like 16-bit textures and triangle fans. However, the application incurs a small performance penalty as it doesn’t have direct access to your hardware, so Microsoft recommends that neither this version should not be used to measure site performance nor to be installed in your enterprise environment. Anyway, better late than never! Google launched its Chrome developer channel five years back, which offers early access to upcoming Chrome features to web developers. Microsoft's move will definitely keep Internet Explorer relevant and open to the development process a bit more.